Victoria emergency management commissioner Andrew Crisp says the crash of an Erickson Aircrane helicopter while fighting bushfires has led to the type being grounded across Australia while the cause of the accident is investigated. The move follows an incident involving Helitak 341 N173AC that ended up in a dam in Gippsland in eastern Victoria on Monday, January 28. Crisp told ABC Radio Melbourne the two Aircranes in NSW, one in South Australia and one in Western Australia, as well as Victoria’s second Aircrane, would remain on the ground until further notice. “At this stage the Aircranes in those other jurisdictions and our other one will not fly until we get assurances from Kestrel and Erickson,” Commissioner Crisp told the ABC on Tuesday. The two pilots and one engineer on board the aircraft survived the incident, the state government’s VicEmergency department said in a statement on its Facebook page on Monday. The aircraft was fighting fires in the Thomson Complex Catchment. “The two pilots and one engineer are safe after swimming to the edge of the dam where the aircraft crashed,” the VicEmergency statement said. Shayne Whiteley posted some photos of the downed aircraft on his Twitter page. Good morning from the State Control Centre in Melbourne and thanks to the thousands of people who have expressed concern and sent well-wishes to the three crew members on the Aircrane helicopter involved in last night's incident near the Thomson Dam.We can reassure everyone that the crew of 'Christine' are safe and well.Victorians fell in love with the Erickson Aircranes when they first arrived to help fight bushfires here in the late 1990s.In the early 2000s, 'Elvis' became one of the most famous of Australia's summer aircranes and was a regular sight in the skies across Victoria and New South Wales.The aircranes and our other aircraft play a vital role in helping to protect Victorians each summer and we extend our gratitude to all of the brave and dedicated men and women involved in air operations. 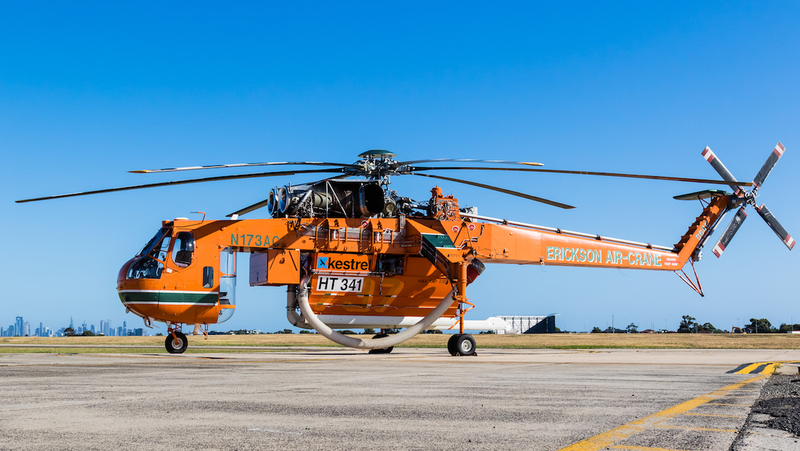 VIDEO: A look at the work of the Erickson Aircrane fighting bushfires from the VicEmergency Facebook page. Very glad all were safe. I wonder if It will ever fly again?